Standard stocked items Delivered within three business days and engraved within 5 business days. 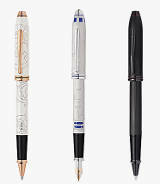 Established for over 60 years A.T. Cross are manufacturer of writing instruments that are more of a fashion item or a piece of jewellery than a pen. If you are looking to make a writing statement then choose Cross, they have a beautiful collection of pens, pencils, pads, portfolios, wallets and cases at competitive prices. When you first visit Cross, you’re instantly invited to sign up to the newsletter with a popup. This could be intruding, but there are two options to close it down: not to be asked again and to be asked later. It’s clear that special invitations and offers can be gained by signing up to the newsletter, so it could be great for those planning on going back again. Once you get to the site, you can see that this is a company that sells pens and writing accessories. The menu makes it very easy to navigate for all your potential needs for visiting, including looking for gifts and for those last chance offers. The one thing that could be improved is the colour of the search bar, which blends in far too well with the header colour. As you scroll down, you can find out about more of the types of offers available through Cross, including engraving and popular knowledge items. For those who love social media and prefer to interact with companies through there, Cross makes it very easy to find them. After sharing all the products, there is a large section that shares the Facebook and Twitter page, hinting that the target audience will be there. There are also clear links to other social media platforms to make it easier for people to find the company on their preferred network. Free delivery is available on orders subject to a minimum order charge, as I’m writing this it was £20. You’d be hard pushed to pay under £20 due to the quality nature of the Cross products. Payment can be made with the usual card method or PayPal checkout.